Becoming a paramedic is an ideal career choice for people that want to help others and can cope adequately in stressful situations. Because of the interest in the field, many academic institutions have started offering online educational opportunities. The best online paramedic programs teach students everything that they need to know to save lives and deliver the best possible assistance. They also come with an excellent price to quality ratio. CentralWashingtonUniversity offers a bachelor of science degree in paramedicine that is 100 percent available online. The program is open to students that already have a certificate or an associate’s degree in the field of paramedicine. An advanced standing major is also available for the individuals that already have some experience as paramedics. This advanced standing option enables them to skip some of the base courses and complete the program faster. The bachelor’s degree can be completed in four years. Some of the courses to choose among include human anatomy and physiology, myocardial disease, advanced clinical practice, general pharmacology for paramedics, advanced trauma care, emergencies in pediatric/geriatric care, patophysiology, EMS response to terrorism and strategic planning forEMS. Clinical practice and an internship are both requirements for the completion of the program. The cost of completing the online paramedic program atCentralWashingtonUniversity is 12,213 dollars for in-state students and 25,026 dollars for out-of-state students. These include lab fees and all additional costs on top of the charge per credit hour. NorthCentralMissouriCollege offers online associate’s degrees in two different fields – paramedic management track and paramedic health track. The management track consists of 36 credits that can be completed in three semesters. Some of the courses in this field of study include human anatomy, general psychology, human physiology, microcomputer applications, principles of management, speech communications and employment strategies. The paramedic health track consists of 31 college credit hours. Some of the courses that students can choose among include human anatomy, microbiology, basic medical terminology, human physiology and principles of pharmacology. All of the required courses can be taken over the course of two semesters. Both of the programs are designed for the needs of people that already have some work experience as paramedics. While most of the courses can be taken online, there is a practical portion of the curriculum that will have students attending in person. The total cost per credit hour is 139 dollars per credit hour forMissouri residents and 178 dollars per credit hour for out-of-state and international students. Financial assistance options are available. Several online programs are available at Davidson County Community College, catering to the needs of different students. There’s a certification program, an associate’s degree and anEMS program. The programs are open both to students that have already worked as paramedics and the ones that don’t have any experience. If you’re just getting started and you don’t hold any prior license, you’ll have to complete 66 semester hours to get the associate’s degree. Some of the courses can be taken during the summer to speed things up. Some of the courses that students can choose among include acute home care, advanced pediatric emergency, hemodynamic monitoring, anatomy and physiology, basic OB/GYN emergencies, health emergencies, basic trauma emergencies, basic patient assessment, pain management andEMS documentation. Apart from the online program, there’s also a hybrid learning opportunity. It involves learning through the online platform and on-campus activities that will give the future paramedics practical skills. The cost of completing the academic program is 21,400 dollars for out-of-state students. Financial assistance options are available in the form of grants, loans and scholarships. George Washington School of Medicine has an undergraduate program in emergency medical services. 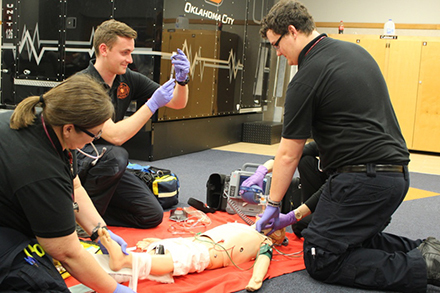 Depending on preferences, students can choose among two bachelor’s degrees – BSHS in emergency medical management and a secondary field of study inEMS. To obtain their degree, students should complete 120 credit hours. The gen ed requirements make up 60 of the credits. Some of these credits can be transferred, enabling students to complete the program faster. George Washington School of Medicine gives the students additional opportunities to continue their education. There’s a master of science in health sciences program that is a natural continuation of the undergraduate paramedic program.